To provide a high quality, affordable program that contributes to strengthening children’s academic and social standing while providing opportunities for parents to develop quality family time. We are a family-focused Center, one that seeks to provide a supportive atmosphere for children and their parents. Pasadena Child Care and Homework Center is uniquely designed to meet the needs of working families. Our Center guarantees a higher level of personal care and individualized attention needed to put parents at ease. We invest in quality staff, which possess the best skills to offer a warm, supportive, and stimulating environment, thereby recognizing the families’ wishes that their child be treated like an individual with their own set of needs. PCHC provides three meals – two snacks and hot lunch for all full-time children in our center. Morning part-timers receive a morning snack and afternoon part-timers receive an afternoon snack. PCHC provides transportation for before and after care. PCHC is a direct response to busy parents’ frustration in dealing with their children’s homework and is uniquely positioned to encourage a more supportive bridge between home and school. PCHC provides a hi-tech, hi-touch program helping children achieve better grades in school. PCHC is moderately and competitively priced to appeal to different income levels of families. PCHC does not only focus on improved academic enrichment, but also focuses on improved social relationships between parents, children, and their community. PCHC is also positioned to accept Purchase of Care. Our Center uses one of the best curricula in the industry – Saxon programs focus on the foundational skills that students need for a lifetime of learning. Our infants receive personalized care to put parents at ease. Our preschool children are prepared for school readiness: the healthy physical, emotional, social, and intellectual development of a child. School readiness skills include listening, observation, paying attention, following directions, small and large motor development, positive self-esteem, language development, imagination and creativity, problem solving, self help, social, reading and writing readiness. 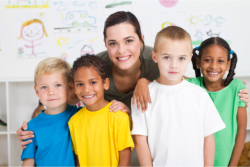 Children are in a safe, clean, supportive, and stimulating environment daily. The Center provides supervised homework for School age children. Summer programs are fun and intellectually stimulating. The Center provides caring, nurturing, qualified teachers. Our educational philosophy is child-centered. Early childhood years are the most formative time in human development. The foundation for self-esteem is laid, and children learn to adapt successfully to the world. We encourage the development of critical thinking skills, creativity, imagination, and self-expression. Curriculum frameworks for each age level provide a consistent plan, while the daily activities reflect the diverse range of developmental levels within each group. Our staff plans daily activities designed to foster development in the areas of social, emotional, physical, and intellectual growth. A choice of various activities, such as art, science, dramatic play, language arts, and others are offered to all children. A small portion of the day is set aside for group activities such as music and storytelling. We offer a variety of “hands-on” experiences in which the children learn by doing. We stress positive self esteem, clear and positive communication, problem solving, decision making, creativity, independence, and the ability to work with others. We are committed to providing an anti-biased, multi-cultural curriculum. The children’s developmental needs and interests form the basis for the program. Our Curriculum: Children Succeed Right from the Start! Pasadena Child Care and Homework Center is committed to using Creative Curriculum for all age groups. The curriculum is the only major math and phonics programs on the market today that systematically distributes instruction, practice and assessment throughout the year. Rather than concentrating the instruction, practice, and assessment of related concepts in a short period of time – usually in a unit or chapter, this distributed approach ensures retention and students are thus able to gain and retain critical math and phonics skills throughout their learning experience. Key concepts are introduced in related increments, recognizing that smaller pieces of information are easier to teach and easier to learn. Because traditional chapter approaches expose children to key concepts only within the chapter, Creative Curriculum’s approach is more effective because it provides continual practice of all concepts throughout the entire year and across grade levels. The Creative Curriculum is a fully integrated, comprehensive curriculum that addresses the educational needs of children ages infant – 5 and prepares them for Kindergarten instruction. Early childhood education can change the lives of young children and children who are exposed to high quality settings and educational materials gain better language and mathematical skills, develop better cognitive and social skills, and cultivate better relationships with classmates.